A group of international astronomers in the UK, France and the USA, led by the University of Leicester, have found proof to confirm the distance and brightness of the most extreme ultra-luminous X-ray source, which may herald a new type of Black Hole. The X-ray source, HLX-1, is the most extreme member of an extraordinary class of objects – the ultra-luminous X-ray sources – and is located in the galaxy ESO 243-49 at a distance of ~300 million light years from the Earth. The astronomers' findings confirm that the extreme luminosity (which is a factor of ~100 above most other objects in its class, and a factor of ~10 higher than the next brightest ultra-luminous X-ray source) is correct. This is forcing scientists to rethink their theories on the maximum brightness of ultra-luminous X-ray sources, and provides support to the idea that HLX-1 may contain an intermediate mass black hole. This latest result will be reported in the scientific journal, 'The Astrophysical Journal'. Using the European Southern Observatory's (ESO's) Very Large Telescope (VLT) in Chile, the team have obtained an optical spectrum of their record breaking ultra-luminous X-ray source (HLX-1) in the distant galaxy ESO 243-49. Their findings enable them to show conclusively that HLX-1 is indeed located within this galaxy, and is neither a foreground star nor a background galaxy. The main implication of this discovery is that ultra-luminous X-ray sources such as HLX-1 can be brighter than was originally thought, which is consistent with at least the brightest of them hosting intermediate mass black holes. A black hole is an ultra-dense object with such a powerful gravitational field that it absorbs all the light that passes near it and reflects nothing. While astrophysicists have suspected that an intermediate class of black hole might exist, with masses between a hundred and several hundred thousand times that of the Sun, such black holes had not previously been reliably detected and their existence has been fiercely debated among the astronomical community. The VLT enabled the team of researchers to confirm the detection of HLX-1 in optical wavelengths and to measure a precise distance to it. The lead author of the paper reporting this result, Dr Klaas Wiersema of Leicester's Department of Physics and Astronomy, commented: "After our earlier discovery of the very bright X-ray source, we were very keen to find out just how far away it really is, so that we can work out how much radiation this black hole produces. 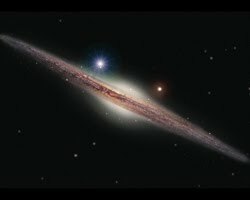 "We could see on images taken with big telescopes that a faint optical source was present at the location of the X-ray source, located near the core of a large and bright galaxy. "We suspected that this faint optical source was directly associated with the X-ray source, but to be sure we had to study the light of this source in detail, using the Very Large Telescope in Chile. "The data we got from the VLT were of a very high quality, and allowed us to separate the light of the big, bright galaxy from that of the faint optical source. "Much to our delight we saw in the resulting measurements exactly what we were hoping for: the characteristic light of hydrogen atoms was detected allowing us to accurately measure the distance to this object. This provided conclusive proof that the black hole was indeed located inside the big, bright galaxy, and that HLX-1 is the brightest ultra-luminous X-ray source known. "Now that we have established the distance to this black hole and now we know where it lives, we would like to find out what makes this source so bright, and how it ended up in this big galaxy." This is a very important result as it is consistent with the idea that HLX-1 contains an intermediate mass black hole. Ultra-luminous X-ray sources are among the most promising candidates for intermediate mass black holes, with masses between stellar mass black holes (around ~3-20 times the mass of the Sun) and the super-massive black holes found in the centres of most galaxies (around 1 million - 1 billion times the mass of the Sun). The research team can now conclusively prove that HLX-1 is not in our own Galaxy, nor is it a super-massive black hole in the centre of a distant background galaxy. This result also confirms that it really is as bright as they thought it was. Dr Didier Barret, of the Centre d'Etude Spatiale des Rayonnements in France, commented: "The XMM-Newton and Swift X-ray observatories are keeping a close eye on this source. The latest data, which was obtained while HLX-1 was very faint, indicates that it is behaving in a very similar way to stellar mass black holes in our own Galaxy, but at a level ~100 - 1,000 times brighter." Dr Sean Farrell, also in the Leicester Department of Physics and Astronomy, commented: "This is very difficult to explain without the presence of an intermediate mass black hole of between ~500 and 10,000 times the mass of the Sun. HLX-1 is therefore (so far!) weathering the scrutiny of the international astronomy community." The centres of most galaxies are thought to contain super-massive black holes, and these powerhouses have an enormous impact on the surrounding galaxy. Super-massive black holes deposit an immense amount of energy into their host galaxies, which has dramatic consequences for the formation of stars and the growth of the galaxy as a whole. Intermediate mass black holes may be the building blocks of super-massive black holes. "Understanding how super-massive black holes form and grow is thus crucial to our comprehension of the formation and evolution of galaxies, which in turn goes part of the way to answering one of the really big questions: How did our own Galaxy form and evolve? "We are very pleased with this result, as it confirms our original discovery of the record breaking ultra-luminous X-ray source. In order to ensure the success of this project, we carefully prepared the VLT observations using data from the US-operated Magellan Telescopes. The VLT data analysis was especially complicated on this project, as it is very difficult to disentangle the signature in optical wavelengths of HLX-1 from the bright galaxy in which it lies. "This work relied heavily on the expertise of researchers at the University of Leicester, and is testament to the high level of skills that are concentrated in our department, which works on some of the biggest questions in astronomy today. This is fitting as we are currently celebrating the 50th anniversary of the founding of the astronomy group here at Leicester." Whether all ultra-luminous X-ray sources contain intermediate mass black holes is still quite uncertain. Dr Farrell's research team will continue studying HLX-1 in order to understand how it formed, where it is located, and what is feeding it. In order to do this they have been granted time on the Hubble Space Telescope to take the highest ever resolution images of this host galaxy, which will allow them to investigate in detail the nature of the environment around HLX-1 and the galaxy which hosts it. Once the Hubble observations are performed, most of the great observatories would have been used to study this source. The next step will be to find out if there are more objects as extreme as this one, and to compare what they know about HLX-1 with the larger population of ultra-luminous X-ray sources. This will help them understand how many intermediate mass black holes might be out there, and where they are likely to find them.